The Department of GIS and RS deals with botanical applications of Geographical Information Systems (GIS) and Remote sensing (RS) methods. Although formally established in June 2007, geoinformatic technologies have been employed at the Institute of Botany under the Department of Geobotany since 1998. Focus on processing and analyses of spatial data offers a broad potential of applications, such as: i) mapping both vegetation and particular species; ii) study of relationships between flora, vegetation and environmental factors; iii) analyses of spatial pattern and spatial relationships of studied objects; iv) analyses of spatio-temporal changes; and v) forest microclimate. Besides providing support for research teams and projects from other departments of the Institute, the Laboratory carries out its own research projects focusing mainly on long-term changes in populations and communities, and their spatial structure on different spatial scales using RS data and field measurements processed in a GIS environment and by spatially explicit modeling. The Laboratory is equipped with complete software for vector and raster data processing and analyses (ArcGIS -ArcInfo and selected extensions; PCI Geomatica Prime 10.0 with Orthoengine module; eCognition Developer 9.2), as well as with equipment for position measurements (GNSS Trimble with decimeter accuracy; and mapping tool Field-Map). We also have Spectral Evolution Full Range Portable Spectroradiometer for remote sensing purposes. The remote sensing (RS) approach, employing temporal sets of both aerial and satellite imagery, can offer a great deal of information about the landscape, its evolution, changes in land-use and land-management, and allows us to study vegetation changes and the anthropogenic impact on it. Aerial photography is traditionally used in Czech botanical research, due to its spatial resolution and availability. 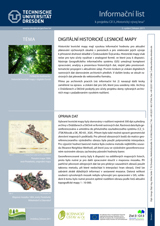 Historic photographs are from archives of both the Agency for Nature Conservation and Landscape Protection of the Czech Republic (focused on Protected Landscape Areas and National Parks) and the Military Geographyand Hydrometeorology Office in Dobruška (containing panchromatic photographs from since the 1940s in approximately ten year intervals). 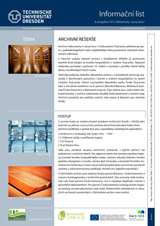 Temporal images are available also from the Czech Office for Surveying, Mapping and Cadastre, as well as from private companies (e.g., Geodis). Aerial images can even be used to study the dynamics of the spread of individual species (if these are distinctive enough to be detected on the images). The initiation of invasion is rarely dated in studies of alien plants. Aerial photographs documenting the invasion of Heracleum mantegazzianum in the Slavkovský les Protected Landscape Area (PLA) in years 1947 to 2006 allow us to quantify the rate of spread and to analyze the species population dynamics. The course of invasion was analyzed from archival as well as temporal photographs on 10 localities of PLA on 11 different dates. Currently the project has been broadened to include the whole PLA. At the flowering or beginning of fruiting (June to August) the species can easily be distinguished on the photographs. Information gathered from aerial photographs includes the area infested by Giant Hogweed, timing of invasion, invaded stand characteristics, intensity of flowering, and structure of Giant Hogweed stands. The invaded area was regressed on residence time (time since the beginning of invasion) and obtained regression slopes were used to measure the rate of spread. Information on invasion development gained from aerial photographs and permanent plots serve as a base for mathematical modeling of invasions. Measured rates of Giant Hogweed spread are comparable to the most aggressive invasive species elsewhere in the world. The strong effect of the rate of spread on the invaded area indicates that local environmental conditions do not markedly limit the spread of H. mantegazzianum. Research on natural systems dynamics on both population and ecosystem levels is often complicated by difficulties in obtaining primary data on studied objects; generally by short-term data series available and low representativeness of data (often only one of many populations or only a small part of the study area can be studied). In such cases modeling of the studied system can help. Fast computer simulations can substitute long-term measurements impossible to carry out in the field. These simulations allow us to test many dynamics scenarios (combination of parameters) and to analyze the role of different parameters on the model dynamics. Simulation results that show a specific phase of the system can then be compared to the observed stage of the real system. The corresponding pattern (e.g. spatial pattern, age structure) can then be used to choose the most probable scenarios and parameter combinations. However it is necessary to be aware of the ambiguous relationship between the recorded pattern and processes leading to its development. Simulations cannot completely replace field observations. Instead of an exact assessment of parameters directly measurable in the field, simulations provide an estimation of a range in which the values of studied parameters can occur. Vegetation of high plateaus of the Krkonoše Mts. National Park sub-alpine zone consists of a mosaic of krummholz (Pinus mugo) and grasslands. The current mosaic has resulted from strong human impact since the 14th century involving cutting and re-planting of dwarf pine (Pinus mugo), and grazing and mowing of grass vegetation. The natural distribution in the highest parts of Krkonoše Mts. is still in question. New studies show that the distribution and character of krummholz significantly influence species composition and the total ecosystem diversity. Analyses of coexistence mechanisms of the two such different life forms – shrubs and grasses – is also interesting from a purely theoretical point of view. The study of long-term population dynamics of the krummholz – grassland mosaic can provide a key to the understanding of relations between its components and thus to the estimates of their natural distribution. Due to the long life of pine combined with its shrub life form and clonal spread the application of classic population ecology approaches based on demographical data collection is very difficult; hence we created a spatially explicit individual-based computer model to investigate it. The model simulates shrub dynamics on an individual level, and grassland vegetation and succession plot dynamics on a patch level. Intraspecific competition is modeled using zones of influence – field of neighborhood (FON). The model covers a 50 x 50 m area, fragmented to cells of 25 x 25 cm size. Model parameters were chosen from field measurements as well as from simulations and a comparison of the modeled and real spatial pattern. The influence of disturbances on the dynamics of the krummholz – grassland mosaic was also simulated. The model predicts possibilities of long-term coexistence of shrub and grass vegetation supported by colonization-competition trade-offs. Disturbances caused mainly by insect defoliators affect the proportion of species in the mosaic yet are not necessary for its sustainability.